This page sharing the latest images and interactive web scenes that are being developed in collaboration with the Boston Redevelopment Authority Geographic Information System and the Urban Design Technology Groups. We have taken the city's planimetric GIS data -- which includes a detailed terrain model, groundplan, walls, benches, street furniture, marine structures and tree points. We have used LIDAR data to determine the heights of the trees. Click to see model architecture diagram. The buildings featured here were created by CyberCity3D Inc.
Workflows for creating the city-wide 3D model were built using ESRI ArcGIS geoprocessing scripts. ESRI City Engine was used to assign 3d objects to the trees and street furniture and to perform essential import and export functions. 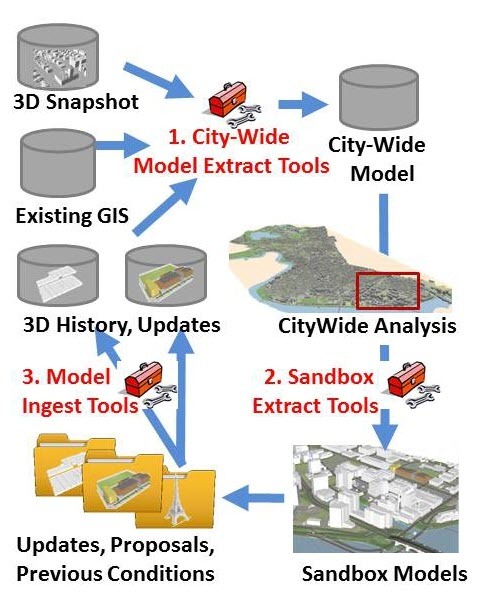 The model Management architecture developed by pbcGIS provides a means of managing model assets that are developed for specific projects so that these assets can be shared with the design community and re-used in future applications of the citywide 3d model. Our GIS architecture for managing city wide 3D models provides a simple database schema and tools for updating the model and for managing versions, including past and proposed future scenarios and distant view corridor impacts. The GIS-based city-wide model is capable of visualizing the dimensional regulations and land use permitted by existing or proposed zoning regulations. This project is in progress with much more to do. Next on our agenda is to train city staff in the uses and maaintenance of the model. Bookmark this page and come back layer to check out our progress. Click to see webscene instructions. WebScenes facilitate understanding of three dimensional alternatives for development and zoning alternatives. These views van be explored interactively in any up-to-date web browser. By clecking the Gear-shaped icon at the upper right side of the web viewer you can adjust the lighting and explore shadow studies for time of day and day of the year. For best results turn on Diffuse Shading . 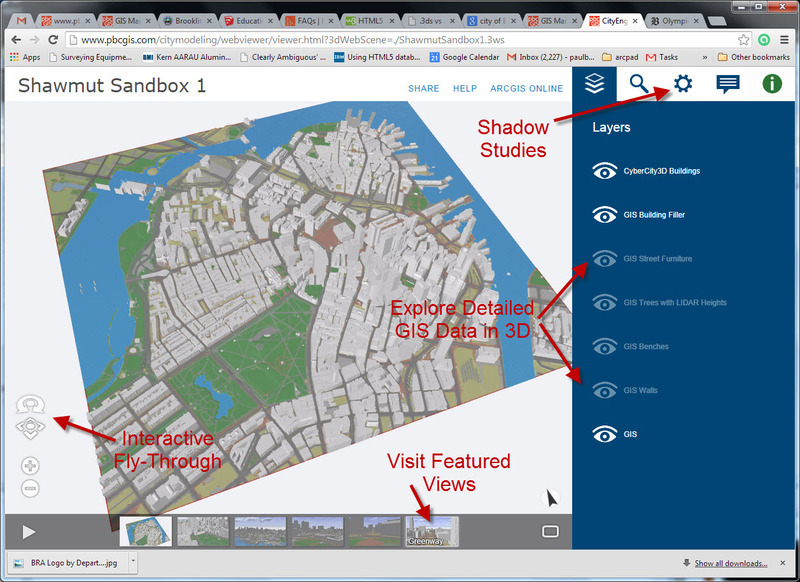 Walk to the Sea Sandbox: This web scene demonstrates the use of the Model Manegement System to organize and manage multiple variations on building models that reflect different levels of detail and alternative scenarios. Hub Sandbox: this large webscene provides a context for exploring the long-distance view impacts of placing an exact scale replica of the Eifel Tower in City Hall Plaza. This model is very large and may challenge some computers without good graphics cards. It is recommended to turn off the trees and d furniture layers when moving around in this model. Distillery Sandbox: demonstrates zoning studies and the development of parametrically driven zoning envelopes and conforming building mock-ups. CityEngine also supports export of models to COLLADA format which can be imported into 3D tools used by designers. The video below was created with Trimble Sketchup. This model demonstrates how the GIS-Based Model Management System will permit the systematic storage and retrieval of alternate building models and scenarios. The model of City Hall in this video was modeled by Google. This rendering exposes some issues with walls and other features that will be tackled after the pilot is completed.